SportsEvents Media Group announced its 2013 class of Readers’ Choice Award winners and the Springfield Convention & Visitors Bureau and Sports Commission were among them. This is the second year in a row that the award has been won by the two groups. Tracy Kimberlin, president of the Springfield CVB, the management organization for the Sports Commission, said it is an honor to be among the award recipients. “We do our best to provide excellent service to sports event planners and the Readers’ Choice Award tells us we’re doing a good job,” Kimberlin said. Lance Kettering, executive director of the Sports Commission, said he was pleased to be nominated and receive the award. 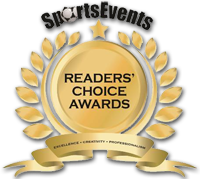 SportsEvents Media Group, the leading industry publication focused exclusively on helping sports event planners produce excellent competitions in the United States and Canada, has announced its 2013 class of Readers’ Choice Award winners. A complete list of award winners is available online at http://www.sportseventsmagazine.com/2013readerschoice. Winners will also be listed in the January 2013 issue of SportsEvents. For more information about the Springfield CVB, Sports Commission and sports events in Springfield, call 881-5300 and visit www.SpringfieldMoSports.org and www.SpringfieldMo.org. The CVB and Sports Commission are nonprofit marketing organizations dedicated to generating economic growth in Springfield through the travel and tourism industry.